The large Trp gene family encodes transient receptor potential (TRP) proteins that form novel cation-selective ion channels. In mammals, 28 Trp channel genes have been identified. TRP proteins exhibit diverse permeation and gating properties and are involved in a plethora of physiologic functions with a strong impact on cellular sensing and signaling pathways. Indeed, mutations in human genes encoding TRP channels, the so-called “TRP channelopathies,” are responsible for a number of hereditary diseases that affect the musculoskeletal, cardiovascular, genitourinary, and nervous systems. This review gives an overview of the functional properties of mammalian TRP channels, describes their roles in acquired and hereditary diseases, and discusses their potential as drug targets for therapeutic intervention. In 1969, a Drosophila mutant was discovered that was defective in light sensing and exhibited only transient light-induced receptor potentials (TRPs) instead of the normal maintained response (Cosens and Manning, 1969). This finding was explained by a defect in an ion channel and triggered the discovery of the large gene family baptized “trp genes” that encode TRP channels (for the history of this discovery, see Minke, 2010; Hardie, 2011; Montell, 2011). By the latest count, the TRP channel superfamily contains 28 mammalian members (27 in humans; see Fig. 1 for the TRP “family tree”) and is subdivided into six subfamilies, all of which permeate cations (reviewed in Clapham et al., 2001; Clapham, 2003; Nilius et al., 2007b; Wu et al., 2010; Nilius and Owsianik, 2011, Gees et al., 2012). The phylogenic tree of human TRP channels. On the basis of sequence homology, all TRP channels fall into seven subfamilies that comprise proteins with distinct channel properties. Note that TRPN1 is only present in lower vertebrates (e.g., zebrafish); TRPC2 is a pseudogene in humans. The bar (0.2) indicates point accepted mutation units, which is the evolutionary distance between two amino acids (1 point accepted mutation unit = 1 point mutation event per 100 amino acids, which is accepted and is passed to progeny). Reprinted with permission from Nilius and Owsianik (2011). As known thus far, all TRP channels share some structural similarities (similarities and differences are shown in Fig. 2). They contain six transmembrane spanning regions (S1–S6), they have a pore-forming loop between the fifth (S5) and sixth (S6) regions, their C termini and N termini are intracellular, and they probably function mostly as heterotetramers or homotetramers (Gaudet, 2008, 2009; Wu et al., 2010; for more detailed information, please see the International Union of Basic and Clinical Pharmacology TRP Channel Database (www.iuphar-db.org/index.jsp). Similarities and differences between the topologic structure of selected TRP channels, representing the ankyrin (TPA1), canonical (TRPC3), melastatin (TRPM2), and vanilloid (TRPV1) subfamilies. TRPA1 is characterized by the unusually high number of ankyrin repeats (after which it was named) at its N terminus, and it lacks the TRP box at its C terminus that is present in the TRPC, TRPV, and TRPM subfamilies. TRPC3 interacts with the scaffolding protein caveolin at its N terminus (that may directly link TRPC3 to the α-subunit of GPCRs); on the C terminus, it has recognition sites for CaM and the IP3 receptor. This binding domain is also referred to as the CaM/IP3R binding site (CIRB). TRPC3 has also been shown to interact with immunophilins (endogenous cytosolic peptidyl-propyl isomerases) as part of the signalplex. TRPM2 possesses four TRPM homology regions (MHR1–MHR4) at its N terminus. At its C terminus, TRPM2 has a nucleoside diphosphate-like moiety X (NUDIX) domain that displays ADPR activity. The ankyrin repeats at the N terminus of TRPV1 are linked to the association of the channel with PI3K, ATP, and CaM. The C terminus carries CaM and PIP2 recognition sites. For further details on TRPV1 regulation, also see Fig. 4. Courtesy of Dr. Rachelle Gaudet (Harvard University). The function of TRP channels is critically regulated by a variety of interacting and/or associated proteins, some of which are described in this work. For more detailed information, interested readers are referred to the excellent database on Mammalian Transient Receptor Potential Channel-Interacting Protein (www.trpchannel.org). TRP channels are nonselective cation channels located in the plasma membrane. Some function as Ca2+ entry channels. Upon activation, they generate cell depolarization that can result in activation or inactivation of voltage-dependent ion channels and modulate the driving force of ion flux through channels and transporters. TRPs can also function as intracellular ion channels, mainly as Ca2+ release channels, in several cell organelles such as lysosomes, endosomes, the Golgi network, the endoplasmic reticulum, and synaptic vesicles (Fig. 3) (Gees et al., 2010). A functional subset of TRP channels—vanilloid TRP channels TRPV1, TRPV2, TRPV3, and TRPV4; ankyrin TRP channel TRPA1; melastatin TRP channel TRPM8; and canonical TRP channel TRPC5—is distinguished by their sensitivity to temperature (reviewed in Szallasi et al., 2007; Voets, 2012). In combination, these channels (collectively referred to as thermoTRPs) cover a broad range of temperatures, ranging from noxiously hot to dangerously cold. 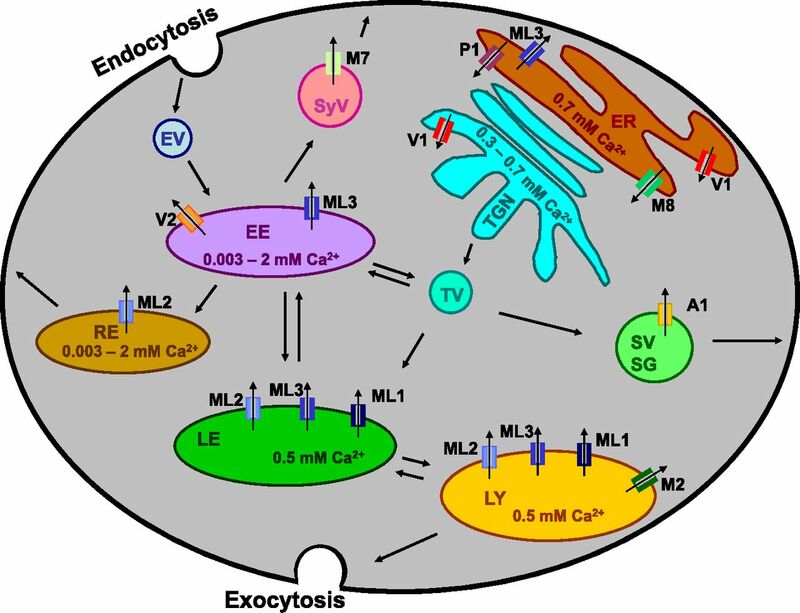 Early endosomes (EEs) derive endocytotic vesicles (EVs) from the plasma membrane. Recycling endosomes (REs) and the late endocytotic pathway via late endosomes (LEs) to the lysosomes (LYs) are indicated. Intermediate transport vesicles (TVs) bud from the endoplasmic reticulum (ER) and trans-Golgi network (TGN). Secretory vesicles (SVs), secretory granules (SGs), and synaptic vesicles (SyVs) are derived from early endosomes. Intracellular locations of TRP channels are indicated by the channel number. Reprinted with permission from Gees et al. (2010). TRP channels are polymodal channels, that is, they can be activated by a plethora of physical (voltage, temperature, force, pressure, and tension) and chemical (both endogenous and exogenous) stimuli (see Nieto-Posadas et al., 2011; Jara-Oseguera and Islas, 2013). The mode of TRP channel activation by these stimuli at the molecular level is, however, still poorly understood. “Chemical” activation of TRP channels by both endogenous and exogenous compounds will be reviewed in the particular channel chapters. There is an ongoing controversy about the direct “voltage activation” (or “modulation by voltage”) of TRP channels such as TRPC5, TRPV1, TRPV3, TRPM3, TRPM8, TRPA1, and polycystic TRP channel TRPP3 (and probably others as well). As opposed to voltage-gated channels that only sense changes in the transmembrane electrical field, TRP channels are polymodal (i.e., integrators of various cellular signals), a property that renders them coincidence detectors (Ramsey et al., 2006; Nieto-Posadas et al., 2011). The role of TRP channels in temperature sensing is well established (Baez-Nieto et al., 2011). However, the list of thermoTRPs is expected to shrink/change in the near future because a number of postulated temperature-sensitive TRP channels (including TRPV2, TRPV3, TRPM4, and TRPM5) are probably not functionally involved in thermosensing. The mechanisms by which TRP channels detect changes in temperature are not clear (for critical reviews, see Latorre, 2009; Baez-Nieto et al., 2011; Voets, 2012; Jara-Oseguera and Islas, 2013). Controversy remains with regard to the function of TRP channels as direct mechanosensors, especially in mammals (see Pedersen and Nilius, 2007). Although TRPN1 (a member of the no mechanoreceptor potential C family) is clearly part of the pore-forming α-subunit of the native mechanoactivated or stretch-activated ion channels (SACs) in ciliated sensory neurons of the worm Caenorhabditis elegans and the Johnston organ of the fruit fly Drosophila melanogaster (together with the TRP channels Nanchung and Inactive) (reviewed in Wilson and Corey, 2010), the situation in mammals remains controversial. For example, the mechanosensitive transducer channel in hair cells of the organ of Corti is clearly not TRPA1 (as was originally suggested by Corey et al., 2004) but is probably the newly discovered TRP-unrelated transmembrane channel-like proteins TMC1 and TMC2 (Pan et al., 2013). Although both TRPV4 and TRPA1 have been implicated in the development and maintenance of mechanical hyperalgesia during inflammation, their roles in physiologic mechanosensing remain to be established. Importantly, none of the TRP channels suggested to function as SACs in free nerve endings and/or Merkel cell-neurite complexes can be directly activated by pressure under experimental conditions (e.g., fast-pressure clamps system) that are used to record SAC-like activity. Other putative mechanosensitive TRP channels (e.g., TRPA1, TRPC1, and TRPC6) could not be activated by membrane stretch in expression systems. It is clear that the gamut of the evidence (extensively discussed in Christensen and Corey, 2007; Nilius and Honoré, 2012; Pedersen and Nilius, 2007; Roudaut et al., 2012; Delmas and Coste, 2013; Eijkelkamp et al., 2013) does not support a direct role for TRP channels in mechanosensing. Indeed, TRPV4 is most likely indirectly force-regulated via a mechanosensing phospholipase A2 (PLA2). Possible exceptions include TRPC1 as a sensor for light touch sensation in cutaneous low-threshold mechanosensory neurons (Garrison et al., 2012) and TRPA1 as a slowly adapting SAC in sensory neurons (discussed later in this work). A proteomic network analysis of TRP channels may resolve some of the above-described controversies by providing novel insights into the functional impact of putative TRP channel β-subunits and associated proteins. This review first describes the main properties of all TRP channels (Nilius and Owsianik, 2011; Zheng, 2013). We then highlight their role in hereditary channelopathies (Nilius and Owsianik, 2010b) and acquired diseases. Finally, we summarize the current state of the field of drug discovery and developmental efforts directed at TRP channels (see also Nilius, 2007; Nilius et al., 2007b; Moran et al., 2011; Kaneko and Szallasi, 2013). The canonical TRP (TRPC) subfamily was the first trp gene family to be cloned in mammals (Wes et al., 1995; Zhu et al., 1995). It contains seven mammalian members (of note, in humans trpc2 is only a pseudogene). As a general remark, activation of these channels is not well understood. Inserted in the plasma membrane, most of the TRPCs are spontaneously active. All TRPC channels contain a conserved TRP box, EWKFAR, in their C-terminal tail and three to four N-terminal ankyrin repeats. All TRPC channels are nonselective cation channels and are permeable for Ca2+. On the basis of sequence homology and similarities in function, TRPCs fall into four groups: TRPC1, TRPC2, TRPC3/TRPC6/TRPC7, and TRPC4/TRPC5 (Vazquez et al., 2004). 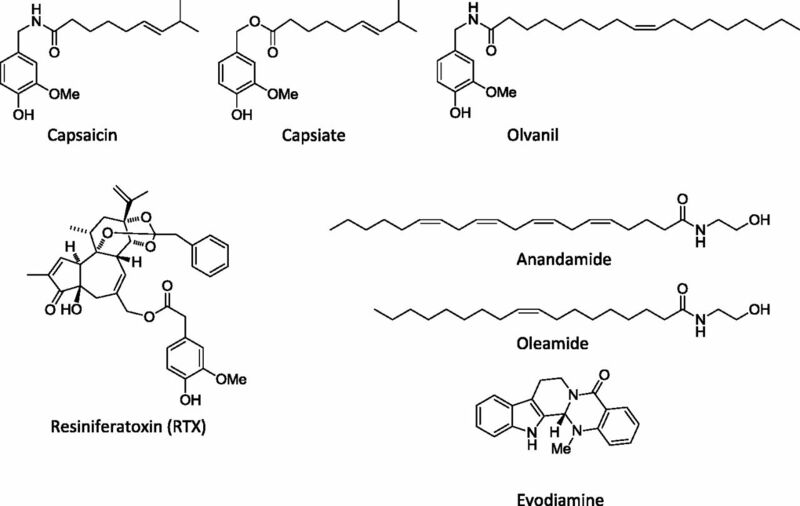 The pharmacological characterization of these channels is hindered by the lack of subtype-specific agonists and antagonists (Bon and Beech, 2013). In general, G protein–coupled receptors (GPCRs) play a central role in the regulation of TRPC channels. Indeed, TRPCs may be one of the most important downstream targets for GPCRs. In many instances, signals from GPCRs to TRPCs are mediated via lipid signals (Kukkonen, 2011). For example, TRPC3, TRPC6, and TRPC7 are mostly activated by members of the Gq/11 family, which are coupled downstream to phospholipase C (PLC)-β. However, for TRPC4/TRPC5, Gαi/o (rather than Gq/11) family members are the dominant activators. Most of the TRPCs are also activated via a PLCγ pathway, downstream of several tyrosine kinase receptors such as the fibroblast growth factor receptor-1 and the brain-derived neurotrophic factor (BDNF). Others comprise the cytokine receptors bone morphogenic protein receptor type II and tumor necrosis factor (TNF) receptor superfamily member 1α, which are coupled to the small body size-mothers against decaplentaplegic family of proteins that transduce extracellular signals from the transforming growth factor (TGF) receptor to the nucleus (Zhang et al., 2013a). Further details are outside the scope of this review. A hallmark of TRPC channels is their differential modulation by lipids, such as diacylglycerol (DAG), phosphatidyl inositols, lysophospholipids, oxidized phospholipids, sphingosine phosphates, and gangliosides, which either change channel activity or influence TRPC insertion in the plasma membrane. It is noteworthy that these lipids are coupled to several proteins, such as caveolins, GPCRs, and the phospholipid-binding proteins, such as the Saccharomyces cerevisiae 14-like (SEC14) and spectrin domain 1 (SESTD1) proteins (Beech, 2012). TRPCs can be coupled with the cytoskeleton via Homer scaffolds with actin or localized in channelosomes with caveolae adapted to the scaffolding protein, caveolin-1. These connections are important for focal adhesions, cell migration, and actin stress fiber formation (Ong and Ambudkar, 2011; Stiber et al., 2012). Members of the closely related TRPC3/TRPC6/TRPC7 group of channels can be activated by DAG, independent of the stimulation of protein kinase C (PKC), suggesting that DAG is the PLC-derived product that mediates the physiologic activation. By contrast, the TRPC1/TRPC4/TRPC5 group of channels, which are also activated by receptor-induced PLC, are unresponsive to DAG (Venkatachalam et al., 2003). The activation mechanism of TRPCs via PLC stimulation is still not completely resolved. All TRPCs exhibit overlapping binding sites for, and interact to a varying extent with, calmodulin (CaM) and the inositol-1,4,5-trisphosphate (IP3) receptor [the binding site is referred to as the CaM/IP3R binding site; Fig. 2] (Trost et al., 2001; Zhu, 2005). Most of the TRPCs are inhibited by a Ca2+/CaM-dependent mechanism and removal of this inhibition may lead to activation. TRPC channels have been reportedly involved in the control of smooth muscle activity (Albert et al., 2009), endothelial cell function (Morita et al., 2011), regulation of the blood-brain barrier (Brown et al., 2008), control of the cell cycle (Madsen et al., 2012), and various functions in the brain such as growth cone guidance, neurotransmitter release, synaptic plasticity [long-term depression (LTD) and long-term potentiation (LTP)], and brain development (Tai et al., 2009; Henle et al., 2011; Hutchins et al., 2011; Amaral and Pozzo-Miller, 2012; Chae et al., 2012). Furthermore, TRPCs are involved in the regulation of neurosecretion in gonadotropin-releasing hormone neurons by stimulating peptide release and activating the reproductive axis in mammals (Zhang et al., 2008a). In this context, kisspeptin, a GPCR ligand (GPR54, also known as Kiss1R), dominates the excitability of gonadotropin-releasing hormone neurons (Rønnekleiv and Kelly, 2013). This pathway seems to be generally involved in the regulation of synaptic plasticity and neurotransmitter release. TRPC1, the first mammalian Trp gene, was cloned in 1995 and 1996 (Wes et al., 1995; Zhu et al., 1995, 1996; Zitt et al., 1996). TRPC1 was defined as a Ca2+-permeable ion channel. It is widely expressed in heart, brain, lung, liver, spleen, kidney, testes, maybe all epithelial cells, smooth muscle cells, endocrine pituitary cells, and glial cells (Wang et al., 1999; Strübing et al., 2001). There are conflicting reports of whether TRPC1 homomers can form functional channels (i.e., whether TRPC1 is really a pore-forming α-subunit; Strübing et al., 2001; Storch et al., 2012). The finding that overexpressed homomeric TRPC1 channels were described as stretch activated by some (Maroto et al., 2005) but not others (Gottlieb et al., 2008; Sharif-Naeini et al., 2008) is also puzzling. By contrast, there is no doubt that TRPC1 can form functional heteromers with other TRPC channels (Strübing et al., 2001; Storch et al., 2012), with TRPV4 (Ma et al., 2010, 2011), and probably also with ORAI1 (a Ca2+ release-activated calcium channel protein), forming store-operated channels (Ong et al., 2007; Cioffi et al., 2010, 2012). In microvessels, TRPC1 together with TRPP1 [polycystic kidney disease (PKD)-2, also referred to as PC2] controls the blood-brain barrier (Berrout et al., 2012). It has been reported that TRPC1 may play a role in smooth muscle contraction (Xu and Beech, 2001), osteoclast formation (Ong et al., 2013), and control of cell migration (Fabian et al., 2008) and is involved in BDNF- and netrin-1–induced axon guidance (Wang and Poo, 2005; for review, see Nilius et al., 2007b; Gees et al., 2012). Adding to this complexity, the TRPC1 gene has multiple splice variants. Isoform-specific (α and β, encoding long and short TRPC1 isoforms, respectively) TRPC1/TRPC4 heteromultimers were reported to have distinct activation mechanisms and gating properties (Kim et al., 2014a). A unique TRPC1 isoform (TRPC1ε) was recently identified in preosteoclasts (Ong et al., 2013). Osteoclasts are formed from a subpopulation of circulating mononuclear cells that are recruited from the blood to the bone surface, where they undergo differentiation. I-mfa–null mice have an osteopenic phenotype characterized by increased osteoclast activity (Kraut et al., 1998). This phenotype is normalized in the I-mfa/TRPC1 double-mutant animals (Ong et al., 2013). The authors speculated that osteoclastogenesis is fine-tuned by I-mfa (positive modulator) and TRPC1ε (negative modulator). If this hypothesis holds true, TRPC1ε activators may be useful in preventing (or even reversing) bone loss. It is noteworthy that TRPC1 is also associated with the β-glucuronidase Klotho, a fundamental regulator of aging. The vascular endothelial growth factor (VEGF) receptor-2/TRPC1/Klotho complex may cause cointernalization of these proteins and regulate TRPC1-mediated Ca2+ entry to maintain endothelial integrity (Kusaba et al., 2010). Leptins through a Janus kinase-2/phosphoinositide 3-kinase (PI3K)/PLCγ pathway can also activate TRPC1. Indeed, TRPC1 is a key channel mediating the depolarizing effects of leptins in hypothalamic proopiomelanocortin neurons (Qiu et al., 2010). TRPC1 also mediates glutamate-induced neuronal death and may represent a promising target for pharmacological intervention to prevent or at least reduce glutamate-induced neuronal damage (Narayanan et al., 2008). Somewhat unexpectedly, evaluation of channel functions in Trpc1 knockout mice has not revealed any dramatic defects. For example, no changes in vascular responses to pressure and/or synaptic plasticity were detected (Freichel et al., 2004). Trpc1 knockout mice, however, do have a slightly increased body weight and impaired salivary fluid secretion (Liu et al., 2007). TRPC2 is not expressed in humans, where it is a pseudogene, although it is present in all other mammals (Vazquez et al., 2004); therefore, it will not be discussed here. TRPC3 is closely related to TRPC6 and TRPC7, with a sequence identity of approximately 75% (topologic structure shown in Fig. 2). The CaM/IP3R binding site region of TRPC3 exhibits higher CaM affinity than seen in other TRPCs (Wedel et al., 2003; Zhu and Tang, 2004). TRPC3 can form homomeric channels but also heteromerizes with TRPC1/TRPC4/TRPC5/TRPC6/TRPC7 in some cell types (Strübing et al., 2003; Dietrich et al., 2005a). TRPC3 is highly expressed in endothelial cells (in caveolae) (Adebiyi et al., 2011; Senadheera et al., 2012), in the brain (e.g., cerebellum, cortex, substantia nigra, and hippocampus) both in neurons and glia (Huang et al., 2007; Roedding et al., 2009; Li et al., 2010; Mitsumura et al., 2011; Zhou and Lee, 2011), in the pituitary gland, smooth muscle, and cardiac muscle cells (Watanabe et al., 2008; Gonzalez-Cobos and Trebak, 2010), as well as in sensory organs such as the cochlea (Tadros et al., 2010). TRPC3 is constitutively active and is regulated by monoglycosylation (Dietrich et al., 2003). TRPC3 is directly activated by both DAG and DAG analogs (Hofmann et al., 1999). It is noteworthy that a very selective inhibitor for TRPC3, pyrazole compound-3 (Pyr3) was recently identified (Kiyonaka et al., 2009). PKC has an inhibitory effect on TRPC3 currents (Venkatachalam et al., 2003). TRPC3 activation is coupled to purine receptors both in endothelial and smooth muscle cells (Kamouchi et al., 1999; Reading et al., 2005). In neurons, TRPC3 is activated by BDNF and is possibly associated with the BDNF receptor TrK-B. This link appears to be essential for the guidance of nerve growth cones by BDNF (Li et al., 2005b; Amaral and Pozzo-Miller, 2007, 2012). In the cerebellum, TRPC3 has been identified as an essential player in LTD (Kim, 2013). In T lymphocytes, TRPC3 is activated by T-cell receptor–triggered immune responses and is probably directly coupled to PLCγ1/γ2, which mediates translocation of the channel (Philipp et al., 2003; van Rossum et al., 2005). TRPC3 is inhibited by cGMP/protein kinase G (PKG); in endothelium, it provides a negative feedback mechanism for the generation of nitric oxide (NO) (Yao and Garland, 2005). In vascular smooth muscle cells, this mechanism may induce relaxation (Chen et al., 2009a). In endothelial cells, vascular cell adhesion molecule-1 (VCAM-1) expression and monocyte adhesion depend on TRPC3 (Smedlund et al., 2010). Cardiac atrial natriuretic peptide binds to the transmembrane guanylyl cyclase and stimulates a unique cGMP-independent pathway, including TRPC3 activation, which might be involved in cardiac hypertrophy (Klaiber et al., 2011). In this context, it is interesting that TRPC3 is involved in mechanosensing, probably via the mechanotransducer zyxin (Suresh Babu et al., 2012). The genes encoding small C-terminal domain phosphatases, which are highly expressed in the heart, contain microRNAs (e.g., miR-26) that negatively regulate TRPC3 expression (Sowa et al., 2012). The nonreceptor tyrosine kinase Src has a stimulatory effect on TRPC3 (Vazquez et al., 2004). This channel is also activated via stimulation of metabotropic glutamate receptors (mGluRs), which is dependent on phospholipase D but not PLC (Glitsch, 2010). PLCγ contains a so-called split pleckstrin-homology domain. The C-terminal half of this split pleckstrin-homology domain has been proposed to interact with an N-terminal site of TRPC3. This direct interaction may cause an increased surface expression of TRPC3 upon PLCγ activation (van Rossum et al., 2005). Moreover, TRPC3 is involved in the control of the erythropoietin-dependent survival, proliferation, and differentiation of mammalian erythroid progenitors (Hirschler-Laszkiewicz et al., 2011). TRPC3 contributes to the constitutive Ca2+ influx in macrophages that is required for macrophage survival (Tano et al., 2011). TRPC3 is also involved in the immunoreceptor activation in mast cells (Cohen et al., 2009). Orexin (hypocretin), a neurotransmitter that regulates arousal, wakefulness, and appetite, is able to activate TRPC3 via orexin type 1 receptor (Peltonen et al., 2009; Louhivuori et al., 2010). Activation of mGluR1 in the cerebellum initiates slow excitatory postsynaptic potentials (EPSPs), which are mediated by TRPC3 (Hartmann et al., 2008, 2011). Finally, it was recently suggested that a TRPC3/TRPC6 complex may form (at least part of) the mechanotransduction channel in cochlear hair cells (Quick et al., 2012). Surprisingly, Trpc3 knockout mice did not show the expected alterations in brain development (Hartmann et al., 2008). TRPC4 is a homolog of TRPC5. It contains a PDZ-binding motif in its C-terminal tail that binds PDZ domain scaffolding proteins. PLCβ1 and PLCβ2 associate with TRPC4 via this domain (Tang et al., 2000). TRPC4 can form functional homomultimers, as well as heteromultimers with TRPC1, TRPC3, TRPC5, and TRPC6 (Strübing et al., 2001, 2003). Similar to other TRPC channels, TRPC4 is widely expressed, including in endothelium, smooth muscle cells, brain (geniculate nucleus, hippocampus, dentate gyrus), the kidney, keratinocytes (in the skin and gingiva), as well as in interstitial cells of Cajal (reviewed in Pedersen et al., 2005). Homotetrameric TRPC4 and heterotetrameric TRPC1/TRPC4 channels are activated after activation of PLC-coupled receptors but the mechanisms that link receptor activation to channel gating are still controversial (Hofmann et al., 1999; Schaefer et al., 2000). TRPC4 is associated with PKG-phosphorylated vasodilator-stimulated phosphoprotein, which inhibits the channel (Wang et al., 2007). Tyrosine phosphorylation by epidermal growth factor receptor (EGFR) activation is critical for plasma membrane translocation and activation of TRPC4; this requires a direct interaction between TRPC4 and the spectrin cytoskeleton (Odell et al., 2008). The two splice variants of TRPC4 are differentially regulated. TRPC4α and the shorter TRPC4β, which lacks 84 amino acids in the cytosolic C terminus, are highly expressed in smooth muscle and endothelial cells. Both TRPC4 variants are activated by Gq/PLC-coupled receptors. Importantly, TRPC4α, but not TRPC4β, was strongly inhibited by intracellularly applied phosphatidylinositol 4,5-bisphosphate (PIP2), which binds to the C terminus of TRPC4α. This inhibitory action was dependent on the association of TRPC4α with actin cytoskeleton that binds to the PDZ domain. PIP2 breakdown is a required step in activation of TRPC4α but PIP2 depletion alone is not sufficient for channel opening, which additionally requires Ca2+ and pertussis toxin–sensitive Gαi-proteins. TRPC4α is also strongly voltage dependent (Jeon et al., 2008; Otsuguro et al., 2008). Moreover, TRPC4 channels can be directly activated by the trivalent cations La3+ and Gd3+ (Schaefer et al., 2000), independently on interference with the Ca2+ sensor. Similar to TRPC1, TRPC4 is believed to participate in store-operated Ca2+ entry in pulmonary artery endothelial cells, leading to the formation of gaps between endothelial cells and subsequent endothelial barrier disruption. The large molecular weight immunophilin FK506-binding proteins FKBP51 and FKBP52 associate with the store-operated Ca2+ entry/TRPC4 channel protein complex (Kadeba et al., 2013). From the phenotype of Trpc4 knockout mice, it is deduced that this channel can be activated via muscarinic receptors and is essential for endothelium-dependent vasorelaxation (Freichel et al., 2001) and regulation of the endothelial barrier function (Tiruppathi et al., 2006). TRPC5 shares approximately 64% sequence identity with TRPC4. The TRPC5 protein also contains a PDZ-binding motif in the C terminus that interacts with the Na+/H+ exchanger regulatory factor (NHERF), an adapter protein involved in signal transduction (Obukhov and Nowycky, 2004). TRPC5 forms homomultimers or heteromerizes with TRPC1, TRPC3, TRPC4, and TRPC6. TRPC1/TRPC5 is the major heteromer in the brain (Strübing et al., 2003). TRPC5 is widely expressed, especially in the brain (hippocampus, cortex, cerebellum, substantia nigra, entorhinal cortex, amygdala, the pre-Bötzinger complex, and the olfactory bulb) (De March et al., 2006; Fowler et al., 2007; Yan et al., 2009), but also in the heart, liver, lung, spleen, testis, and uterus (Philipp et al., 1998; Beech, 2007). TRPC5 shows considerable similarities to TRPC4 in its gating properties. Homotetrameric TRPC5 and heterotetrameric TRPC1/TRPC5 channels are activated via PLC-coupled receptors, but the mechanism underlying this link is not yet clear (Beech, 2007). The muscarinic receptor/Gαq-11/PLCβ1 cascade seems to play a crucial role in the activation of brain TRPC5 (Yan et al., 2009). TRPC5 is modulated by lipids (e.g., sphingosine-1-phosphate) and, in general, it senses bipolar phospholipids (AL-Shawaf et al., 2011). TRPC5 is modulated by covalent modification of reactive cysteines and functions as a redox sensor. It is activated by extracellular application of the endogenous redox protein, thioredoxin (Xu et al., 2008), by endogenous hydrogen peroxide (Yamamoto et al., 2010; Naylor et al., 2011), oxidized phospholipids (Al-Shawaf et al., 2010), and NO (Yoshida et al., 2006). As is the case for all TRP channels, currents through TRPC5 are modulated by plasma membrane insertion or retrieval of the channels. Plasma membrane insertion of TRPC5 can be promoted by epidermal growth factor (EGF). This effect requires the presence of Rho GTPase, Rac1, PI3K, and phosphatidylinositol 4-phosphate 5-kinase (Bezzerides et al., 2004). Protein kinase A (PKA) inhibits TRPC5 via Gα proteins (Sung et al., 2011). TRPC5 is also inhibited by neuroactive steroids (Majeed et al., 2011). PIP2 is involved in channel regulation. Its breakdown is required for desensitization of TRPC5 current, but PIP2 depletion alone is insufficient for channel desensitization (Kim et al., 2008a). Extracellular lanthanides (at low concentrations), Gd3+, lead, increased [Ca2+]i, and also protons, directly activate TRPC5 (Jung et al., 2003; Zeng et al., 2004; Semtner et al., 2007; Blair et al., 2009; Sukumar and Beech, 2010). TRPC5 is in cross-talk with voltage-activated Ca2+ channels in several tissues (Gross et al., 2009). It is noteworthy that TRPC5 is also activated by cold; this observation adds TRPC5 to the list of thermoTRPs (Zimmermann et al., 2011). The activation pattern of TRPC5 becomes complex because of its striking Ca2+ dependence (Blair et al., 2009), and especially because of its voltage dependence. Indeed, TRPC5 I–V curves change during the activation-deactivation cycle, shifting between outwardly rectifying and doubly rectifying shapes. Depolarization activates the channel (Obukhov and Nowycky, 2008). It is noteworthy that TRPC5 is also a redox sensor: it senses oxidative stress and induces adaptation reactions. Finally, TRPC5 is activated by cell swelling, which hints to some mechanosensing properties (Gomis et al., 2008). TRPC5 is reportedly involved in various cellular functions such as cell migration, contribution to the working memory establishment, growth cone guidance and dendrite extension, cardiac pacemaking, and mitosis. TRPC5 is also involved in erythropoietin effects, motility of gastrointestinal smooth muscle, and much more (Lee et al., 2003c; Ju and Allen, 2007; Kaczmarek, 2010; Tian et al., 2010; Liu et al., 2011b; Zhang et al., 2011b; Kaczmarek et al., 2012). An intriguing new modulation mechanism describes the activation of TRPC5 by hypo-osmotic cell swelling via activation of Gq-coupled receptors, which, in turn, enhances the activation of TRPC5 by regulating the membrane insertion of this channel. Because Gq-coupled receptors and TPRC5 are coexpressed in several tissues (e.g., vascular system, glia cells, and neurons), the Gq-coupled receptor mechanism of TRPC5 activation may have interesting and far-reaching implications in arterial pressure sensing and mechanotransduction (Jemal et al., 2013). From the phenotype of Trpc5 knockout mice it can be deduced that this channel is involved in fear-related behavior (reviewed in Kaczmarek, 2010). The TRPC5-null mouse shows no apparent anatomic or developmental defects. However, a reduction in responses mediated by synaptic activation of group I metabotropic glutamate and cholecystokinin (CCK)-2 receptors in amygdala neurons was present in the Trpc5 knockout animals (Riccio et al., 2009). This nucleus is involved in fear reactions, which are diminished in the knockout mouse (Riccio et al., 2009). TRPC6 shares a sequence identity of approximately 75% with TRPC3 and TRPC7. It likely has four ankyrin repeats, which interact with MxA (a member of the dynamin protein family), and has two glycosylation sites, which control channel activity and trafficking (Dietrich and Gudermann, 2007). TRPC6 can form either homomultimers or heteromultimers with TRPC3 and TRPC7 (Dietrich et al., 2005a). TRPC6 is widely expressed, especially in smooth muscle cells, in lung, heart, brain, and kidney (glomerular podocytes), as well as in blood and immune cells. TRPC6 expression has also been reported in the adrenal gland, bone, epididymis, intestine, ovary, pancreas, and prostate (see Dietrich and Gudermann, 2007). In contrast with TRPC3, TRPC6 is (almost) inactive under unstimulated conditions, which might be attributed to the double glycosylation (Dietrich et al., 2003). TRPC6 is activated by Gα/q11-coupled GPCRs and forms the essential part of the vascular α1-adrenoreceptor–activated Ca2+-permeable cation channel complex in smooth muscle (Inoue et al., 2001; Jung et al., 2002b). Endotoxin lipopolysaccharide (LPS) activates TRPC6 in endothelial cells in a Toll-like receptor-4–dependent manner (Tauseef et al., 2012). There is increasing evidence to suggest that TRPC6 plays important functions in smooth muscle and endothelial cells. TRPC6 is directly activated by DAG and DAG analogs (Hofmann et al., 1999; Estacion et al., 2004). PKCδ exerts an inhibitory effect on TRPC6 through direct phosphorylation (Bousquet et al., 2010). Tyrosine kinases also activate TRPC6. This is thought to play an important role in VEGF-mediated angiogenesis that requires TRPC6 activation (Hamdollah Zadeh et al., 2008; Ge et al., 2009). TRPC6 is activated by cAMP, possibly via the cAMP-PI3K-PKB-MEK-extracellular signal-regulated kinase (ERK) 1/ERK2 cascade (Shen et al., 2011a). TRPC6 plays a key role in excitatory synaptic transmission, plasticity, and neural development. It inhibits N-methyl-d-aspartate (NMDA)–induced currents probably via activation of calcineurin and functions as a negative modulator of NMDA receptors (Shen et al., 2013). TRPC6 channels can be negatively regulated by the NO/cGMP/PKG pathway (Takahashi et al., 2008; Koitabashi et al., 2010). PI3K and its antagonistic phosphatase, phosphatase and tensin homolog, are involved in the activation of TRPC6 and promote its plasma membrane insertion (Monet et al., 2012). Insertion is also promoted by Rab11, a member of the Ras superfamily of monomeric G proteins (Cayouette et al., 2010). Of note, TRPC6 couples to the Na+/Ca2+ exchanger and thus might contribute to any signaling mechanism that depends on localized cytosolic subplasmalemmal Na+ elevation (Poburko et al., 2008). At least in endothelial cells, cAMP/PKA induces intracellular translocation of TRPC6 channels in caveolin-1–rich areas, which potentiate its activation (Fleming et al., 2007). The epoxygenase metabolite 11,12-epoxyeicosatrienoic acid potentiates the contractile responses in pulmonary arteries via TRPC6 activation (Loot and Fleming, 2011). Platelet-activating factor also activates TRPC6 in endothelial cells. On the basis of these observations, it was suggested that TRPC6 is involved in the control of the endothelial barrier. For example, activation of TRPC6 disturbs the barrier function and translocates it in caveolae of endothelial cells (Samapati et al., 2012). As shown now for many TRP channels, TRPC6 is activated by reactive oxygen species (ROS; e.g., H2O2) (Graham et al., 2010; Ding et al., 2011). TRPC6 activity is potentiated by flufenamate and the eicosanoid 20-hydroxyeicosatetraenoic acid (Inoue et al., 2001; Jung et al., 2002b). It is also is activated by thrombin and platelet-activating factor and plays an important role in platelet activation (Hassock et al., 2002; Dionisio et al., 2011, 2012). Remarkably, TRPC6 has been also identified as a “candidate” mechanosensing TRP channel that is activated by stretch and may contribute to mechanosensing in the heart (Spassova et al., 2006; Dyachenko et al., 2009). Hyperforin (structure shown in Fig. 6), one of the main bioactive compounds that underlie the antidepressant actions of the medicinal plant St. John’s wort (Hypericum perforatum), is a potent TRPC6 activator and promotes channel expression (Leuner et al., 2007; Griffith et al., 2010; Harteneck and Gollasch, 2010). As with all TRPCs, TRPC6 is a nonselective cation channel with Ca2+ selectivity similar to its closest homologs, TRPC3 and TRPC7. However, although TRPC6 is Ca2+ permeable, under physiologic conditions TRPC6 induces depolarization and mainly Na+ enters the cell via this channel. It is only at very negative potentials that Ca2+ entry through TRPC6 becomes significant (Estacion et al., 2006). TRPC6 is also a Zn2+-permeable channel (Gibon et al., 2011). With regard to its functional impact, TRPC6 has been identified as an important player in dendritic growth, neuronal survival, and synapse formation (Jia et al., 2007; Zhou et al., 2008). Strikingly, mice overexpressing TRPC6 show enhanced spine formation and improved spatial learning and memory formation in the Morris water maze test, suggesting a role for the channel in synaptic and behavioral plasticity (Zhou et al., 2008). The important role of TRPC6 in smooth muscle cells is supported by data from Trpc6 knockout mice, which unexpectedly exhibit a slightly elevated blood pressure associated with enhanced basal and agonist-induced cation entry. This effect is due to a compensatory upregulation of TRPC3 and TRPC7 (Dietrich et al., 2005b). TRPC6 plays a unique and indispensable role in acute hypoxic pulmonary vasoconstriction (also known as the Euler–Liljestrand mechanism), a local vasoconstriction in the lung that shifts blood flow from hypoxic to normoxic areas, thereby maintaining effective gas exchange. Trpc6 knockout mice lack the hypoxic pulmonary vasoconstriction reflex and develop arterial hypoxemia during conditions of regional hypoventilation (Weissmann et al., 2006). It is noteworthy that TRPC6 is expressed in podocytes, where it is required for establishing the glomerular filtration barrier (Reiser et al., 2005). TRPC6 also plays an activating role in cell migration downstream of the CXC-type, Gq protein–coupled chemokine receptors and TRPC6 downregulation strongly impairs the chemotaxis of neutrophils (Damann et al., 2009; Lindemann et al., 2013). TRPC7 occurs in two different splice variants. It shares an 81% and 75% overall identity with TRPC3 and TRPC6, respectively. It forms homomultimers, but also heteromultimers with TRPC1, TRPC3, and TRPC6, and is widely expressed in tissues from brain, eye, heart, intestine, kidney, lung, and pituitary gland. It is constitutively active and can be further activated by GPCRs or DAG analogs. It is negatively regulated by extracellular Ca2+ and PKC (see Numaga et al., 2007). TRPC7 is also negatively regulated by the cGMP-regulated protein kinase I pathway; that is, cGMP-regulated protein kinase I –mediated phosphorylation inhibits the channel (Yuasa et al., 2011). The functional role of TRPC7 is still not well understood and phenotypic alterations in Trpc7 knockout mice have not yet been described. 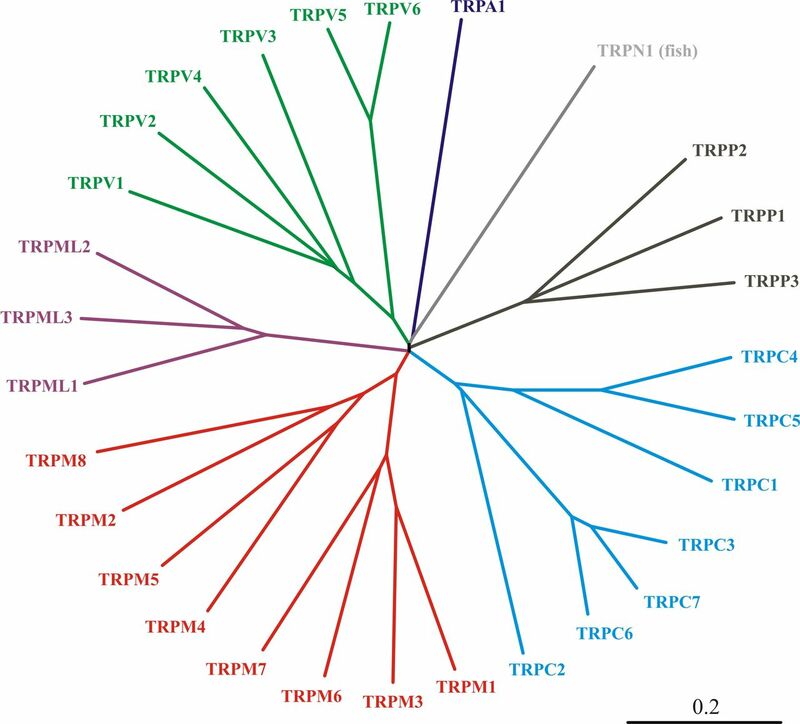 The TRPV subfamily comprises six members that, based on homology, fall into four groups: TRPV1/TRPV2, TRPV3, TRPV4, and TRPV5/TRPV6. This vanilloid subfamily was named after its founding member, the vanilloid (capsaicin) receptor VR1 (Szallasi and Blumberg, 1999; Nilius and Owsianik, 2011). Members of the TRPV subfamily function as tetrameric complexes with each subunit containing six N-terminal ankyrin repeats (Gaudet, 2008, 2009). All members have a TRP box in their C terminus (Fig. 2). 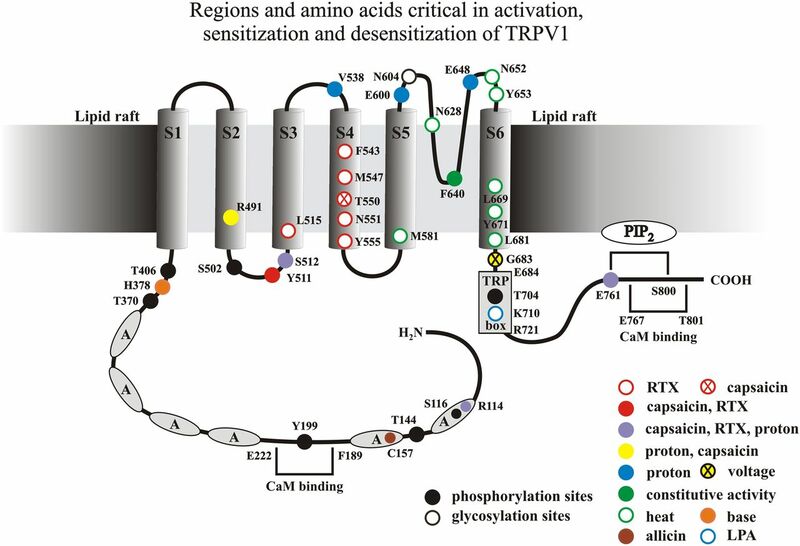 TRPV1, TRPV2, TRPV3, and TRPV4 are modestly permeable to Ca2+, whereas TRPV5 and TRPV6 are the only highly Ca2+ selective channels in the TRP family. These latter channels are tightly regulated by [Ca2+]i. Remarkably, TRPV1 has a dynamic pore, meaning that it shows pore dilation during stimulation (Chung et al., 2008) (Fig. 4). TRPVs seem to be also permeable for large cations (Chung et al., 2008). The physiologic significance of this dilation is unclear. TRPV channels show a complex pharmacology including very selective agonists for some TRPVs, such as capsaicin (structure shown in Fig. 5) for TRPV1, but mostly less selective activators such as 2-aminoethoxydiphenyl borate (2-APB; see Fig. 6 for structure) for TRPV3 and, to a lesser extent, also TRPV2 and TRPV1 (for a comprehensive review, see Vriens et al., 2009). Ruthenium red blocks all TRPV channels with variable potencies (IC50 values within the range of 0.1–9.0 μM) (for a review, see Vennekens et al., 2008). TRPV1 channel topology highlighting key residues and amino acids (hot spots) involved in gating function in response to different stimuli (e.g., capsaicin, protons, and heat). The hot spots represent cumulative evidence from site-directed mutagenesis experiments; they provide evidence for distinct vanilloid (capsaicin/RTX), proton, alkaline (base), heat, and allicin recognition sites. Black circles designate phosphorylation sites for PKA and PKC that are involved in channel sensitization. LPA, lysophosphatidic acid. Reprinted with permission from Szolcsányi and Sándor (2012).